While you may be familiar with the various ways in which your garage door makes your life easier, you may not immediately be able to call to mind the function of every moving part. However, understanding how your garage door works can be instrumental in completing your own troubleshooting projects and articulating to garage door specialists what might be wrong if bigger problems arise. Why not dive on in and get an up-close-and-personal look at your garage door? The following parts, based on the popular sectional garage door model, allow your door to do its job well. Your door’s torsion spring counterbalances the weight of your door so that it can lift easily. Both this spring and the bottom hinge are under constant tension and should not be tampered with, as one mistake could cause serious injury. Contact our experts at Ponderosa to troubleshoot any issues with your door’s springs. The garage door track guides the door up to the ceiling and back into the garage space. Keeping these tracks in good condition is essential to safe functioning of your garage door. Galvanized garage door tracks can corrode if they have extended contact with rock salt. In addition, dirt and debris can clog the track, making the door wobble to stick. In either case, keeping the track clean and free of debris will ensure proper function. Rollers ride inside the track and move your garage door up and down. Steel rollers make noise, while those made of nylon are quieter. 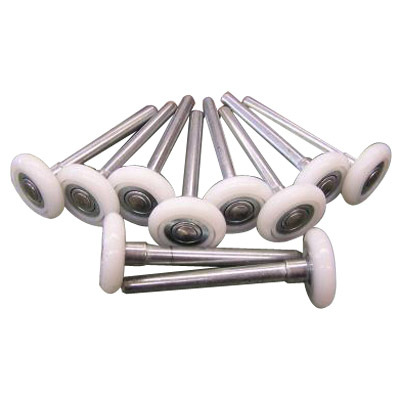 Because rollers move up and down the track repeatedly, day in and day out, they are prone to wear. Contact your garage door specialist for tips on how to properly replace them. The hinge on your garage door connects horizontal sections as they move. Hinges that emit noises when working or stick together are common and can be fixed by oiling or lubricating the mechanism. If the hinge does not free up after oiling, it may need replacement. Sections of your garage door are linked by hinges and usually hold up well over time. Garage doors are built with specific sections in order to allow for the folding that occurs as the door slides up and and into the garage along tracks. The interior of your garage provides protection against the elements for your vehicles, stored items, tools, gym space, or whatever else you may use the space for. Weatherstripping against the edges of the door protects against air infiltration, sealing the climate within your garage. Getting to know the mechanics of your garage door can help you identify issues quickly when they arise and determine whether you can DIY your repair or if you should contact a pro. For all inquiries, large and small, don’t hesitate to contact Ponderosa.